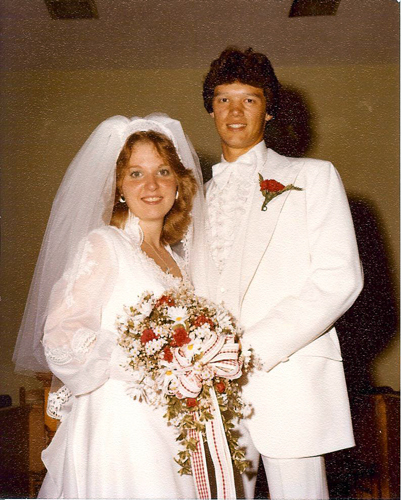 Thirty-six years ago today Brian and I were married. We stood in front of our friends, family and God and promised to love, honor, and cherish one another until death do us part. Divorce… never! Murder… maybe! That Brian and I are both still alive, and still married, is the result of our stubbornness (or “strong will” in today’s vernacular), our understanding of, and commitment to, “What God has joined together, let man not separate,” and most of all God’s amazing grace. Brian and I know how difficult it is to keep promises; humans are just not good at promise keeping. God, on the other hand, is an amazing promise keeper; he keeps every promise he makes. God promises that when someone decides to become a Christian, that person is united with God in Christ Jesus in a union that cannot be broken or undone. It is a done deal: as a Christian, you belong to God. You are his and he is yours. One of the sweetest parts of this union is that God initiated it! God chose you! For you and for me it means that whatever our circumstances, no matter how dark the day, how fearful the night, how fierce the storm, how lonely and deep the silence, the Almighty, all powerful, all consuming God is with us. And not just an “Oh well, at least I have God.” – God is not the consolation prize when we don’t get the things we think we want. God is the prize. God is the goal. God is our portion. God is sufficient. God is what we have and what we need. Because of God’s promises, we know that God has not, nor will he ever abandon us. We know that God is actively at work in our circumstances and therefore we can be content. When life is difficult and suffering is acute, the promises of God anchor our souls in hope and security. Meditating on the promises of God fuels contentment. These promises are but a sampling of the hundreds of promises God has for us. He is at work in all things for our good. He will sustain us. He will give us all things. His presence is always with us. His strength is sufficient in our weakness. There is no need for anxiety, there is no call for worry when we recognize the depth to which we are united to God in Christ. When we fix our thoughts on who God is, what his promises are, and the reality of who we are in him, he will bring us peace in every difficult situation and every alarming circumstance – there will be contentment. Contentment is a battle that is won in the mind as we meditate on who God is and his promises to us. Will you allow God to transform your thinking so that you can enjoy contentment in whatever his good and perfect will is for you? Yes, but the ride, the memories and the experience are priceless. Love you, too. Thank you! Sometimes us Christians make this day to day more work than it is. 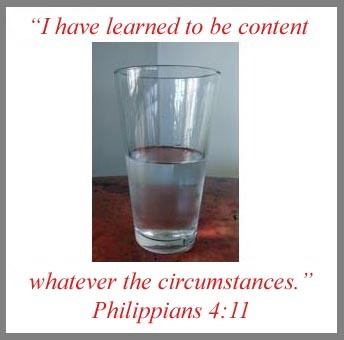 Marcia, thank you so much for your series on contentment – they have been both helpful and serve as a reminder of how many times I forget or think that God doesn’t know what is going on in my life… I have to daily remind myself that He can’t be contained in any box I try to put Him in… sending much love! I think we all have boxes 😕 Thankfully, he keeps breaking them apart! !